above ground cisterns storing residential safe drinking water, rainwater harvesting, long term water storage,emergency potable water storage, fire protection water tanks & farm irrigation. Complies with U.S. Food and Drug Administration regulation 21CFR 177.1520 (1) 3.1 & 3.2 for storage of potable water. Tank Depot's premium water tanks are an effective, economical way to store potable (drinking) water for Residential and Commercial applications. Our polyethylene water tanks use resin which complies with U.S. Food and Drug Administration regulation 21CFR 177.1520 (1) 3.1 and 3.2 for storage of potable water. 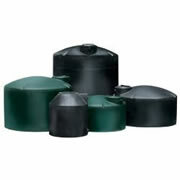 Tank Depot Water Tanks can be placed on any FLAT, firm, level surface for simple installation. Water Tanks are lightweight and can be rolled by hand into place. Care should be taken not to damage Inlet/Outlet when moving water tanks. Water Tanks are for storage and are not designed to be pressurized. These tanks are designed for water use only. * 45 Gallon - 250 Gallon: 1" Female Threaded Inlet & 1-1/2" Female Threaded Outlet is standard. * 300 Gallon & up: 1-1/2" Female Threaded Inlet & 2" Female Threaded Outlet is standard.